European IIS 10 Hosting - HostForLIFE.eu :: How To Manage IIS Server Online? Hey folks, now it’s possible to manage your IIS (Internet Information Services) Server right from the Browser. I am going to share the steps , which I was required to perform before it started running. It was simple though. Right now, the Service is in “Preview” mode, hope to see this launched very soon! 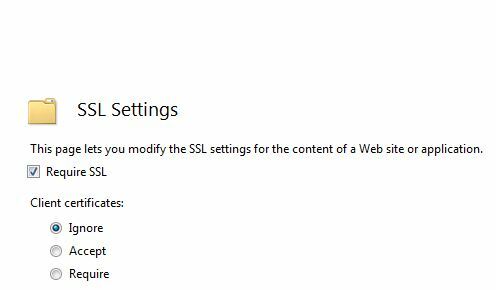 “To start, head over to https://manage.iis.net and download IIS Administration Setup. As soon the download starts, it shows you another screen waiting for the Service to be installed and run and let you proceed further. The installation failed twice. It asked me to install “Microsoft Visual C++ 2015 Redistributable (x64)” first and then asked to install “Microsoft .NET Core 1.0.1 Windows Server Hosting”. I had no other trouble during the installation. My machine config at the time is Windows 10 Enterprise (x64) / i5 / 12 GB. I did an IIS reset and the waiting Window started receiving signals. The first screen prompted me with a default port (PORT# 55539) on the localhost address and asked me to supply an “Access Token”. The link, given below in the input box lets you generate or refresh the access token. In the background, it installed “Microsoft IIS Administation Service” exposing a Web Service on port 55539. I’ve yet to figure out, if the port is configurable or not. 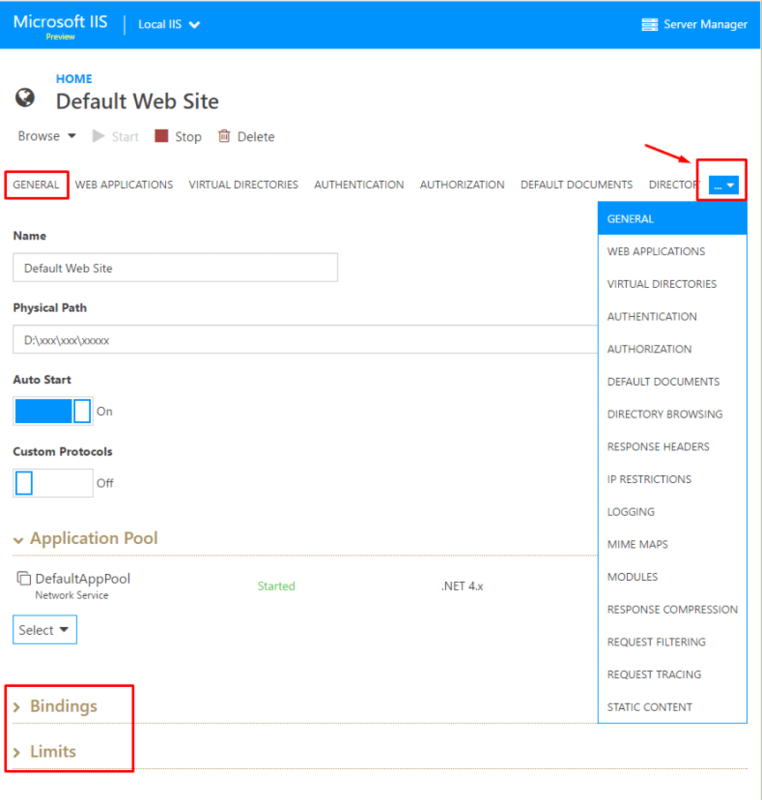 Generate an access token and supply to IIS Management form and you are done. 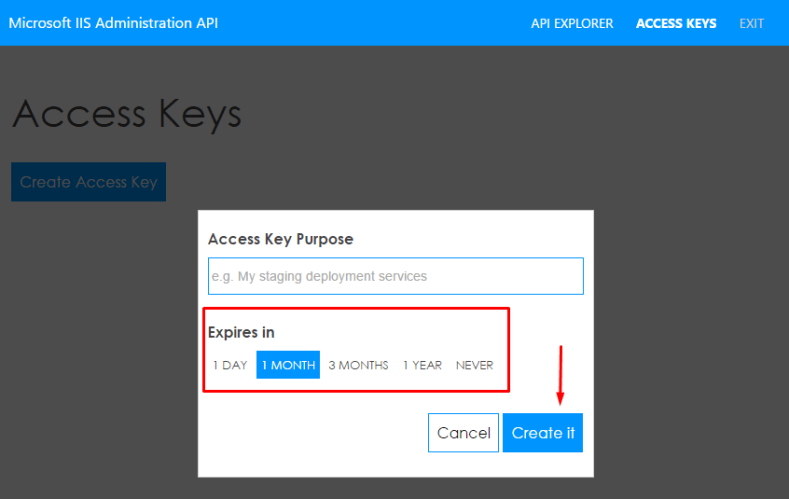 It also allows you to set how soon the access token should be expired. IIS Administration Setup needs to be installed on the machine running IIS Server. 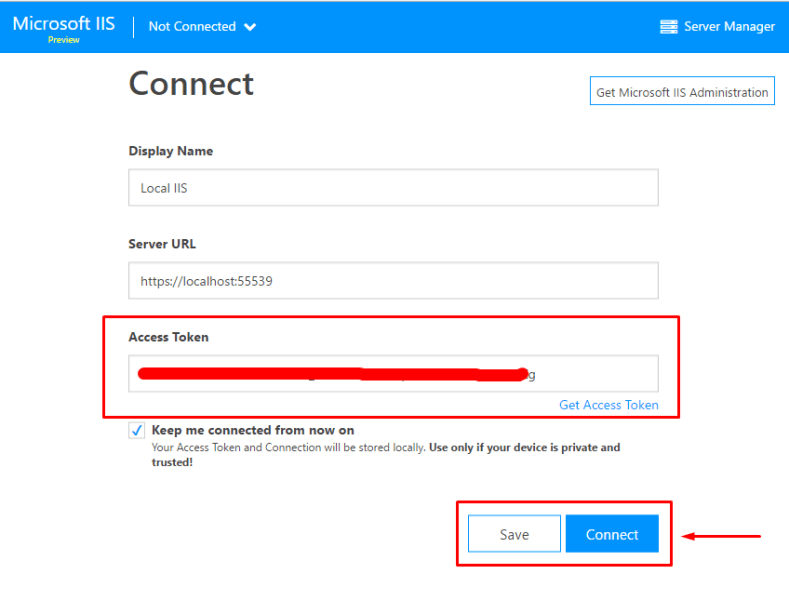 To manage any IIS Server online, you just need the Access Token. 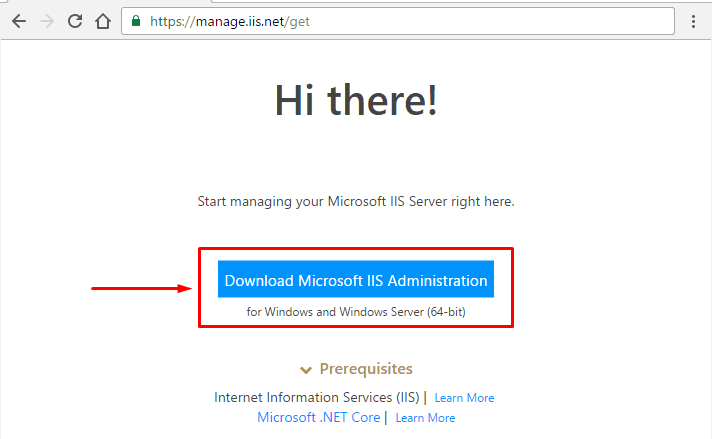 Install IIS Administration Setup and its dependencies on IIS Server machine. (It will install and start “Microsoft IIS Admistration” Service). Generate Access Token on the machine. 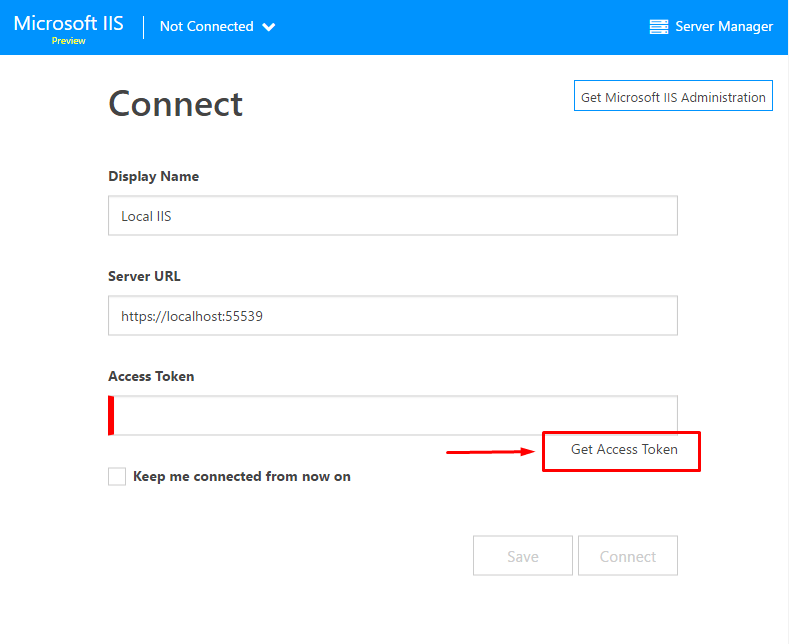 Use the token any where in the world to access IIS Server, which belongs to the token. Make sure the port 55539 is allowed from the network, which you’re trying to access the IIS Server over the Web. 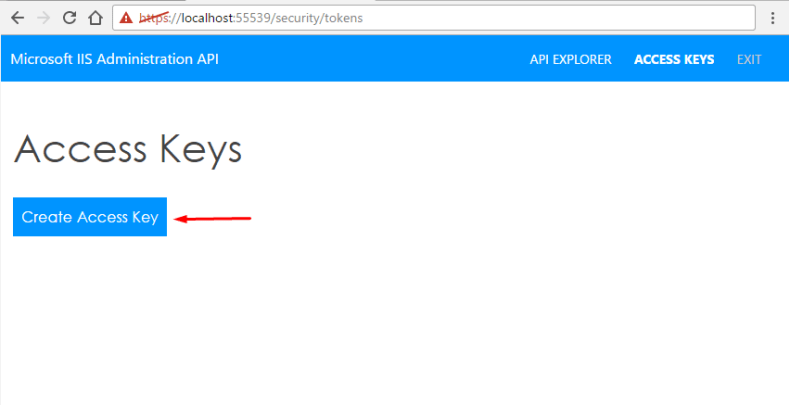 You can refresh the key anytime, which you want to (or an access token has been compromised). Server and Website Administration is very smooth with the Web console. All the options from IIS Manager are available online and are very user friendly. You can do pretty much everything from the Web console, which comes available with IIS Manager on Windows. I’ll leave the rest of the exploration for you. Hope, you enjoyed it. Thanks for reading. When it comes to the option of dedicated servers, you may find it costly in comparison to other web hosting options. But ultimately, the choice is worth making because plenty of commercial benefits are integrated into this web hosting plan. Let’s see how it is a better option than others web hosting plans. In dedicated hosting arrangements, the service provider reserves the SLA, including the solution of hardware failure. The service provider maintains a support team for 24x7. With expert skill sets and ITIL complaint methods you can be sure about a high uptime. This is a cost efficient option. According to the plan, a dedicated hosting service provider is responsible for upgradates and maintenance of hardware for maintaining connectivity, and for offering a friendly physical environment. Under this plan, you as a user have no obligation to pay for the total server room or for employing a service administrator. Under this plan you have to pay for the services you will be using. Under this web hosting plan you will get to enjoy higher internet speed. There is no chance to lose the speed as there is no risk of sharing the connection. This will help in faster communication, upload management, and uninterrupted business presence. If you select dedicated web hosting, you will enjoy a complete monopoly of decisions about using site management tools and allied other applications to boost your hosting environment. However, about the tools, you need to get prior approval from your hosting service provider that they will be able to give you backend support to maintain them. Dedicated hosting service offers uninterrupted access to physical server. The security arrangement includes supervision cameras, Biometric Access Control System, round-the-clock patrolling, etc. for improved security. Advanced service providers often provide additional supports like DDos guard, web application firewall, VAPT, and security event management. These reasons can clearly justify why Dedicated Server is a better option. It is clearly understood that although expensive, this category of web hosting service offers excellent ROI (Return over investment). European IIS 10 Hosting - HostForLIFE.eu :: How to Enable HTTP Strict-Transport-Security (HSTS) on IIS? In this article, we will only show simple tutorial about how to enable and serve HTTP Strict Transport Security (HSTS) response header in IIS. HSTS improves security and prevents man-in-the-middle attacks, downgrade attacks, and cookie-hijacking. You can set a HSTS header through your functions.php theme file as well. For this to happen, you can hook into the send_headers action. Trace \ Track is a vulnerability that is usually identified on an IIS server when we run PCI compliance and find this vulnerability. A hacker can run a Trace attack on IIS Website and get information about the Backend server and other important information. In latest versions on IIS (IIS 6.0, 7.5) Trace is disabled by default but still it is good idea to make sure that Trace is disabled on IIS. 1. Go to command Prompt of your Machine. The urlscan.ini file is included as part of URLScan . This sets by default a configuration setting "UseAllowVerbs=1". In this [AllowVerbs] section of the ini file, only http methods that are allowed are GET, HEAD, and POST so simply by installing URLScan on an IIS server , we can assume that it protected from TRACE or TRACK. IIS 7.5 Hosting - HostForLIFE.eu :: How to Manage IIS with Appcmd? In this tutorial, I will tell you about Manage IIS with Appcmd. What is Appcmd? The appcmd.exe is a single command, used to manage IIS 7 and above. It is used to manage the Server without using a graphical administration tool. The appcmd is located in C:\Windows\System32\inetsrv (%systemroot%\system32\inetsrv\) directory. By default, it will not add into environment variable. Creating and configuring the sites. To list the running worker process. Backup and restoring the site configuration. 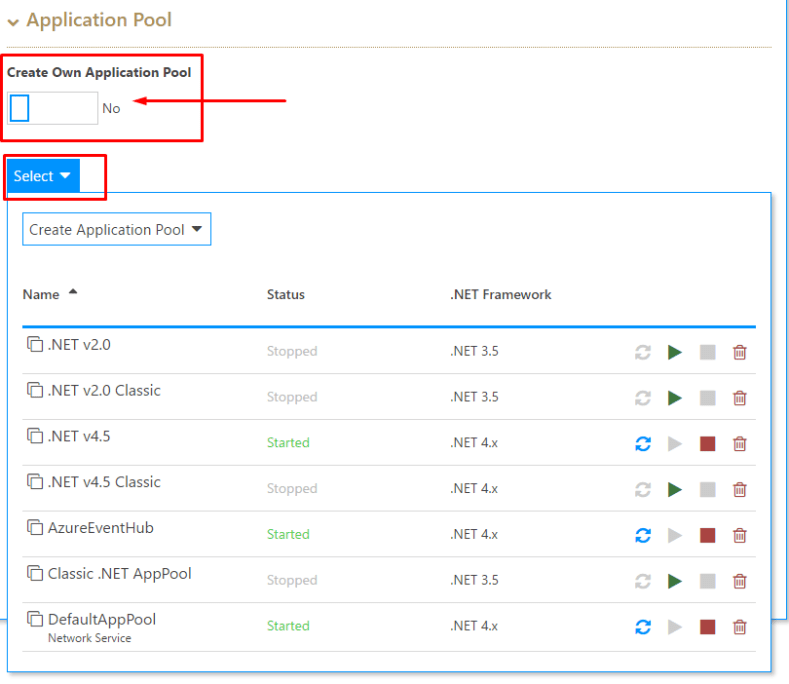 Retrieve the information about the Application pools. appcmd list site "Default web site"
appcmd add site /name:"added using appcmd" /bindings:"http/*:81:localhost" /physicalPath:"D:\test"
appcmd delete backup "backup name"
appcmd restore backup "locahostbkup "
appcmd restored configuration from backup "locahostbkup"
appcmd start site "Default web site"
appcmd stop site "Default web site"
IIS 7.5 Hosting - HostForLIFE.eu :: How to Deploy NopCommerce in IIS? First method is very easy to implement. Second method need some extra work. 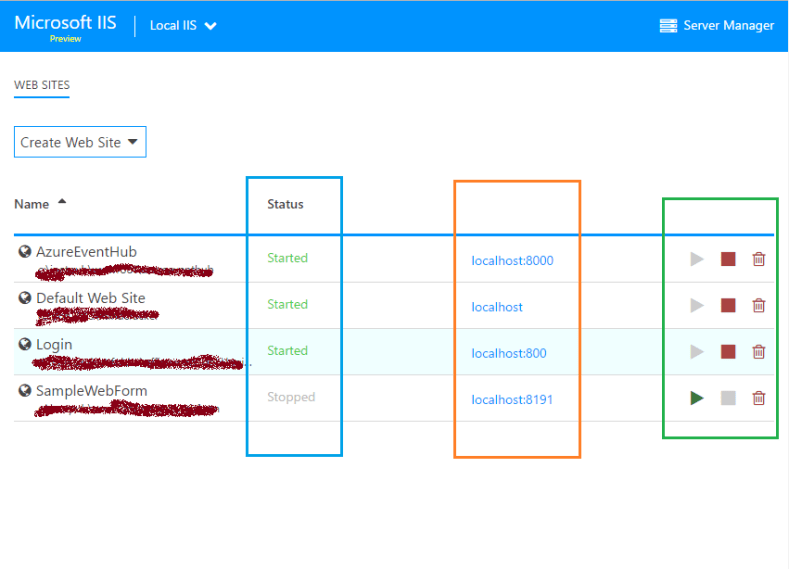 It is always better idea to deploy production code in local IIS host before deploying it in live server. If your developing asp.net application in visual studio you will use IISExpress to run the application. Most of the time IISExpress may not show those error which will be shown by IIS. For example when i run the nopCommerce in visual studio it worked properly but when i deployed it in Local IIS i fond a unknown error "Could not load type 'System.ServiceModel.Activation.HttpModule......."
Extract nopCommerce_2.80_Source.rar at your desired location. I am using F:\DotNetProjects. The extracted folder contains below items. 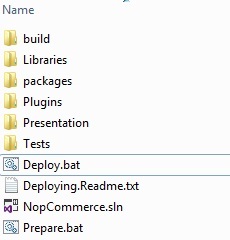 In that folder Prepare.bat, Deploy.bat are the deployment tool given by NopCommerce. First Run prepate.bat it will display bunch of text in command prompt and finally Build success message. Now Run Deploy.bat again it will show you bunch of text in command prompt and finally Build success message. If you observe a new folder called Deployable is created automatically. This is our production code we need to deploy in Live Server. Before we deploy it in live server we will deploy it in local IIS. Now Just go to you iis manager. Expand the items in your left sidebar. 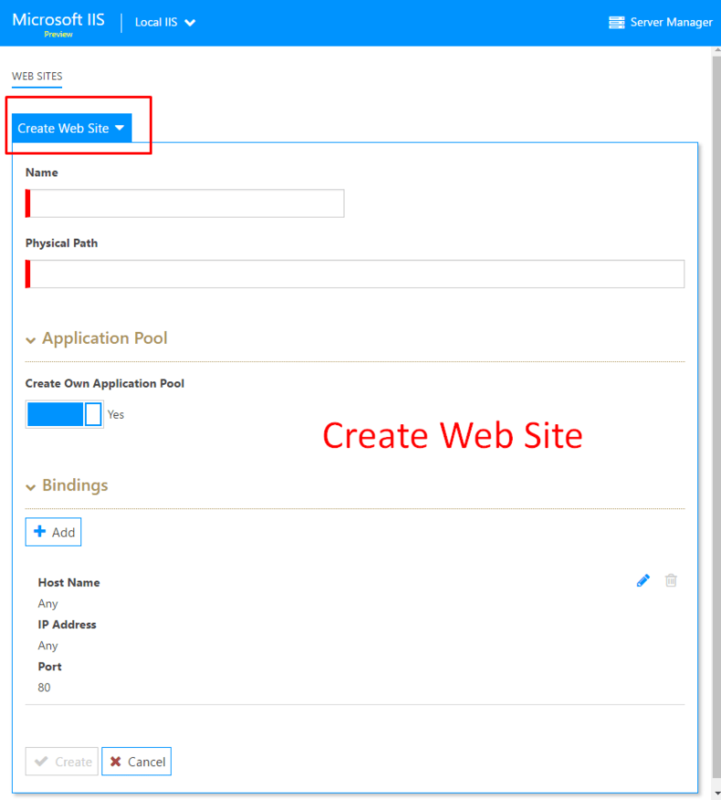 Right click on Default Web Site and select Add Application form the menu. Enter details. Physical path field must be point to your Deployable folder. Now open your broser and enter http://localhost/nop. If there is no error it will redirect you to http://localhost/nop/install folder where you need to enter details like admin email,password, db connection details and click install. If everything is ok NopCommerse Will install successfully. At step 10 in above process you may get this error. If you got this error you can resolve it by using simple tool "aspnet_regiis.exe". Just go to C:\Windows\Microsoft.NET\Framework64\v4.0.30319 (path may different for 32 bit pc)in your command prompt. Run the the tool like this. "aspnet_regiis.exe -iru" this will execute some command and the problem should fixed. If you got this error there are different alternative you can fix this error. But I will explain most simple one only. Run NopCommerce.sln under nopCommerce extracted folder(Refer step 2). Run the NopCommerce Application (ctrl+f5). 3)It will prompt you to enter db details(refer step 11). Enter details as shown in step 11 and click install. This time you wont face any problem (as i told earlier at beginning). If it asked for db details enter exact details you entered before. Voila! you successfully installed NopCommerce. Go back to your to Visual studio where you open nopCommerce solution and build the solution. Right click on Nop.Web click publish. Now right click on Nop.Admin and publish with sub-directory as /Admin under same directory you selected in previous step. copy all files you found under /admin/bin to /bin. Now copy copy InstalledPlugins.txt,Settings.txt text to add_data folder(Just follow steps i explained in Errror2 section of this post). That's it everything is great now. 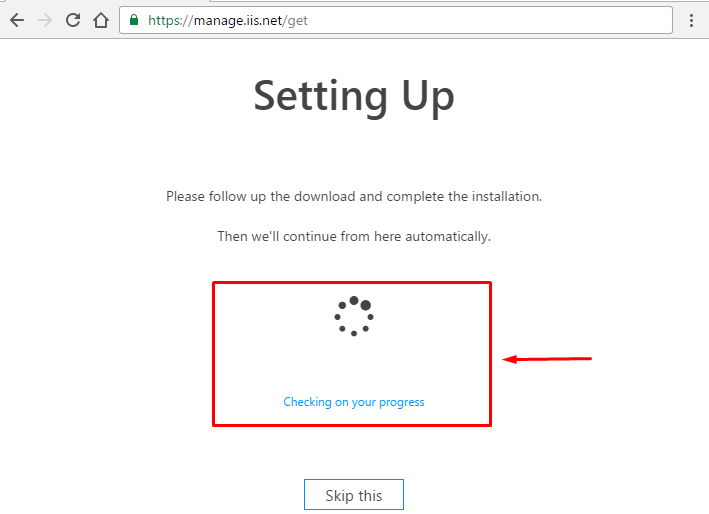 IIS 7.5 Hosting - HostForLIFE.eu :: How to Install SMTP Service? Click ‘Next’ and the wizard will install the SMTP Server for you. By default Windows installs the service and sets it to manual start. If you restart the server at any time the SMTP service will not start automatically which will result in your application not being able to send any e-mail. Open the MMC Services Snap-In, Find the ‘Simple Mail Transfer Protocol (SMTP)’ Service and double-click it. Set the ‘Start-Up Type’ to ‘Automatic’ Apply and close the window. You will note on Windows Server 2008 (& R2) that it will install two IIS Managers. The SMTP server is managed through IIS 6.0 and not IIS 7.5. Type your domain name in the text box provided and click on ‘Finish’. Do not add the @ symbol as per the example below. Click on ‘Outbound Security’ and select your authentication type. In this example I am leaving the authentication to ‘Anonymous Access’ as I will lock down the server through limiting relay. Click ‘Ok’ and close all the domain windows. Select the ‘Access’ Tab and Click on ‘Authentication’. Your Authentication at this level must match the authentication set at the domain level as per Step 5. In this example Anonymous Access is our preferred method. An ‘Open Relay’ is the greatest risk to your SMTP server as it could be used by SPAMMERS to send their malware and other unsolicited mail. We are going to restrict this server to only accept mail and relay it for the localhost on which the application resides. Ensure the Radio Button which states ‘Only the list below’ is selected. Untick the box which states ‘Allow all computers that successfully authenticate to relay, regardless of the list above’. Click on ‘Add’ and in the window provided type in the IP address of your server. Once done click ‘OK’. Your ‘Relay Restrictions’ dialogue box should now look like the one below. Click ‘Ok’. Your SMTP Server is now ready to send e-mail. You can click through the other configurations and change mail size limits and retry intervals etc. But by default the settings are good enough for this example. You can test the service using a Telnet session from the Command Line. Note that since Windows Server 2008 the Telnet Client is not part of the base install. You will need to install it using the ‘Add Features’ wizard as we did to install the SMTP Server in Step 1 above. If the server is situated behind a Firewall ensure that it will allow SMTP (TCP Port 25) outbound from your SMTP server. Open the Command Prompt and type ‘Telnet’ to start the Telnet client. Type ‘set localecho’ hit enter and then type ‘open 127.0.0.1 25’ and hit Enter. You will be presented with the SMTP Server Header.Now type ‘helo me’ note the single ‘l’ and hit Enter. The server will respond with Hello and the IP Address. Now type ‘mail from:<yourname>@<yourdomain.com>’ and hit Enter. Now enter the address you want to send mail to by typing ‘rcpt to:<name>@<senddomain.com>. Now type ‘Data’ and hit Enter. Type ‘Subject:This is a test’ and hit Enter twice. Type ‘Testing’ or anything else you want to send as body text and hit Enter. type ‘.’ i.e. full stop and hit Enter. Your mail should now be sent and should be received within standard e-mail timeframes.